Is a Landscape Design Really Necessary? Professional landscape designers know their stuff! They see the potential in your yard, no matter how big or small, simple or complex, to be transformed into something amazing! Great designers listen and will discuss with you your ideas for your dream outdoor space. Sometimes a client may have a wish list that is bigger than their budget and it’s the designer’s job to figure out how the client can still get the beautiful outdoor space they want without breaking the bank. To do this they may suggest phasing in certain elements over time, or switching out materials so the client still gets to enjoy their beautiful yard, but only at a portion of the cost of the original materials they were considering. This is the type of invaluable knowledge you will benefit from when working with a designer. Why Have a Landscape Design? A final design- sometimes also called a master plan- will have everything drawn out to scale and labeled. Depending on the designer, the plans may be colored, or black and white. Sometimes a perspective drawing will be included, or a detail of a special feature in the proposed space. Once you have your finished landscape design you can show it to the contractor you are working with to make sure everyone is on the same page. This is especially helpful if you’re working with several different companies. When DON’T I Need a Landscape Design? If all you’re wanting to get done in your backyard is to transplant a couple of shrubs and add a few decorative boulders, a full design plan may not be necessary in this case. Some companies do offer design consultation services if you are interested in making some adjustments to your yard, even if it’s not going to be a full transformation. Say you have a budget of $3,500. If the designer charges $75/hr for 20 hrs of work ($1,500 total) then you’ll only have $2,000 left to actually implement the installation. Remember to always make sure you understand the designer’s payment policy before signing the contract! Before You Grab That Shovel! 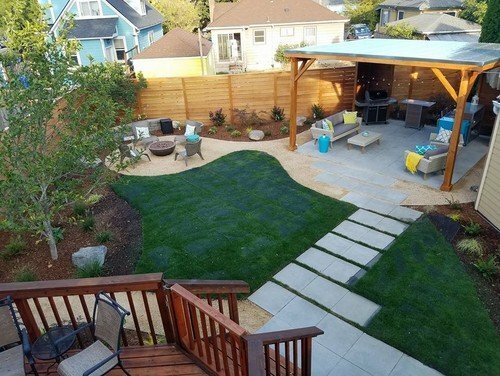 Whether you decide to work with a professional designer or not, it’s always good to consult an experienced landscape contractor before making any major changes to your outdoor space, especially if it involves digging in the ground or building structures. Not only do you want your new outdoor space to be beautiful, you want it to be safe and long lasting. Contact us to schedule a consultation with one of our landscape professionals. Happy landscaping!